Those born between February 10, 2013 and January 30, 2014 are members of the Water Snake Chinese Zodiac sign. Those born under the sign of the SNAKE are romantic, passionate, charming and well informed. Snakes are intellectuals, philosophers, and deep thinkers. They strive to succeed in all that they do. The are extremely self-critical. Snake personalities often make their way to the top. They ensure that they are in the right place at the right time, which means when the right people are there as well. Snake people should seek their fortunes as professors, writers, philosophers, or psychiatrists. With the fluid influence of the Water Element, the Water Snake is the most intuitive and understanding of the Snake signs. Instead of facing their challenges with force, the Water Snake uses social skills and gifts of communication to reach their goals. Unlike the other solitary Snake types, the Water Snake wins over friends with charisma and warmth. In this sense, the Water Snake can be amongst the most loving of the Snake types. As is the case with all Snakes, the Water Snake can be secretive and has a tendency to hold grudges. The intuition and social intelligence of the Water Snake creates a variety of career opportunities to explore. With gifts for compassion and an interest in human welfare, the Water Snake could do well in politics, law, medicine, or therapy. Similarly, by embracing their intellectual interests, careers in science, engineering or social science could also be fitting. On the other hand, those born under the Water Snake sign have been known to be successful entertainers. While the Water Snake has many positive qualities, their zodiac influence is not without its negative attributes. With more of an open mind than other Snake types, the Water Snake can suffer from indecisiveness. In the same sense, their lack of convection can cause them to be too passive at times. 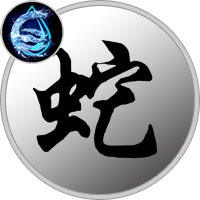 In order to counter these downfalls, those born under the Water Snake sign are encouraged to follow their intuition and take a firmer stance in life. Influential, motivated, insightful, and highly intellectual are words that best characterize Water Snakes. These Snakes work well with others and enjoy being recognized and rewarded. They’ll reveal feelings to those closest to them, but no one else.